Now I'm adding an alphabet wall!! The best part about an alphabet wall is you just can't go wrong.....You can find a letter in anything if you just use your imagination. My plan was to add this feature to my son's room BUT I decided to put in above my faux wainscoting and boy do I ever LOVE it!! At every meal my son and I go over the alphabet he loves to walk up and down this walk and say his ABC's. Oh wow! So fabulous! I wish you much happiness in your new (wonderfully decorated) home! Oh, I love it! The T is so perfect. I never get tired of seeing alphabet walls--each one is so unique. Your board & batten wall is gorgeous. I really want to get motivated to do that in our dining room! Great job! I've never seen this before! It would look great in my kids playroom! That looks really cute and different. So whimsical! Would you consider linking this project to the Tell Me Tuesday link party on Vintage Pollyanna? I really love this! It is just so cute. Stopping by from Tot tuesdays at Delicious Ambiguity. I really love how you did yours in a line instead of an a square. Super cute idea. 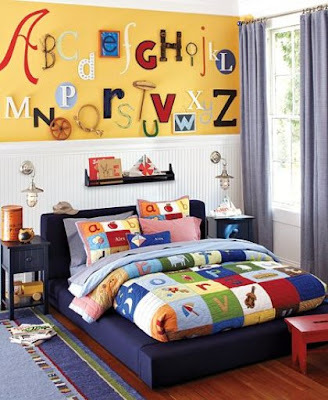 I love alphabet walls!! This looks fabulous! I would love for you to linkup! How cute! So great you had the stuff on hand. I've realized that these letters can be made from nearly anything. Love this! The letters, the paint, the wainscoting... they go together perfectly! Thanks for linking up! I'll be featuring this on Saturday! Wow, that's very creative ! Looks good ! What a great idea. My kids would love this. Now I have to think of where. Now my wheels are turning. GREAT JOB!! This looks great! I love all the varieties of letters. JDaniel needs something like this for his room. Such a cute idea. I love how each letter is it's own crafty little art piece. That looks great. My children's playroom is in the middle of a huge redo, and I'm planning on putting the alphabet on their wall, too. I'm your newest follow. Come be mine, too, if you like my stuff. This is a wonderful project! Thank you so much for sharing. P.S. Visiting from Fireflies & Jellybeans "Show Off Your Stuff" link party! What a great look that is! And the airplane T is just perfect. I LOVE, LOVE, LOVE your LETTERS! Great idea!! Too cute ... thanks for the inspiration! I have been collecting "letters" for years and NOW I know what I'm going to do with them! How very cool! I love your take on it. It is so sweet that you are able to add beauty to your home and a nightly lesson for your son. Beautiful! Very inspiring! It looks great. I'd love for you to come link up at Fun For Kids Friday. So so cool. I'm sure the kids love it. I love the 'P' in the frame! Great job, it's really nice! It's a great idea to put it in a public space so every can enjoy it! The colors and details are so fun! 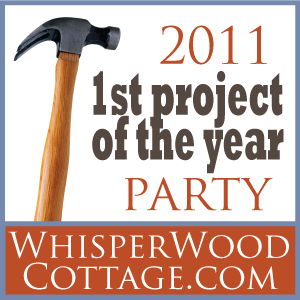 Thanks for linking up at WhisperWood Cottage!! Such a very clever idea! I love this. Swoon!! It's a most wonderful wall-love it! 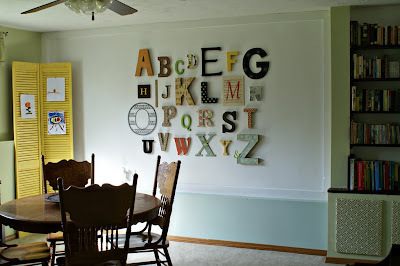 I also loved the Pottery Barn alphabet wall and used it as inspiration to create one in my home. I love it with the wainscoting. Great job! I love this! It looks so good! 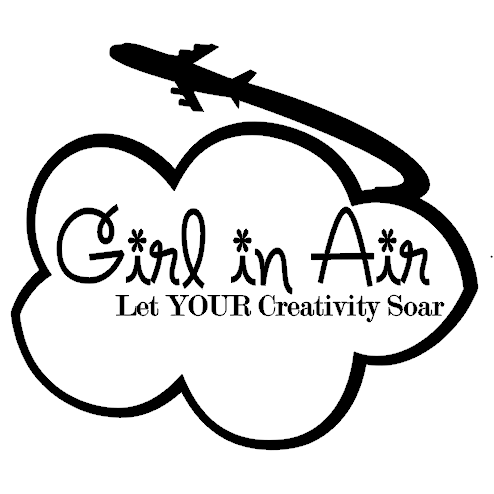 I especially like the airplane T.
I love the way that each letter is so individual. Together, they make a great feature! AMAZING! I am so in love with this idea! I will have to book mark this for sure. I would LOVE it if you would link this up to my linky party on Tuesday. I love your creativeness. I don't seem to have enough time to do all the projects I would love to do. I still want to do the other one you shared. Great idea! Love that each letter is so unique. Oh my goodness, this is adorable! thanks so much for sharing! AWESOME!! This would be great in my future playroom! Thanks for linking up to Mad Skills Monday! What a clever girl you are. This is such a unique take on an Alphabet wall. That tiny framed "P" is so sweet. Thanks for sharing all your nifty talents with us on this little journey through Alphabe-Thursday! You are really a neat and creative person. This is so fun! The textures and colors are great! It really looks great! Love the plane as a T. I think it is great how you used what you already had. I also really like the nice brown color of your wall. I have brown on two walls in my bedroom and I had a really hard time finding just the right shade. Your alphabet wall is FABULOUS! Love it against the dark paint. My favorite is the plane! I love your alpha-wall! Great job! What fun!!!! I hadn't even considered creating my own alphabet. It looks great. Thanks for linking up to Topsy Turvy Tuesday's! This is fabulous! Man, now I wish I picked up random letters I have seen here and there. I did wonder how you stuck it to the wall though? Wow, it looks just like the pictures. Great job!! All wonderful ideas. I'm hosting a $50. CSN gift certificate giveaway for anyone in the US or Canada so drop on by! I featured you as a Fave today on Vintage Pollyanna! 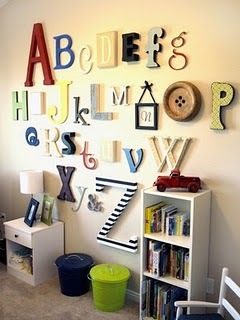 I love your alphabet wall. I just saved a bunch of pics from houzz to blog about! Very Cool! Fabulous!!!!! Absolutely love it... Im a brand new follower and look forward to what else you will show me! thanks for linking up at our crafty saturday party! can't wait to see what you have for next week! I seriously love this. I am tickled pink! Very awesome! Love how the letters can really be any object, such as the plane. Now, I'm trying to imagine where I would put something like this in my home! You did such a great job! Whimsical and simple. I love it! I featured this on my blog today!!! I love that so much! I am about to change my youngest child's room into a big boy room. This idea is so neat! Thank you for sharing! Hello...I just wanted to say I loved this post so much...I had to do this in my house. Thanks for the inspiration and I just posted the finished wall over on my blog. I feel like I just read Chicka Chicka Boom Boom, LOL!! Love the wall! Thank you for sharing these interesting ideas.